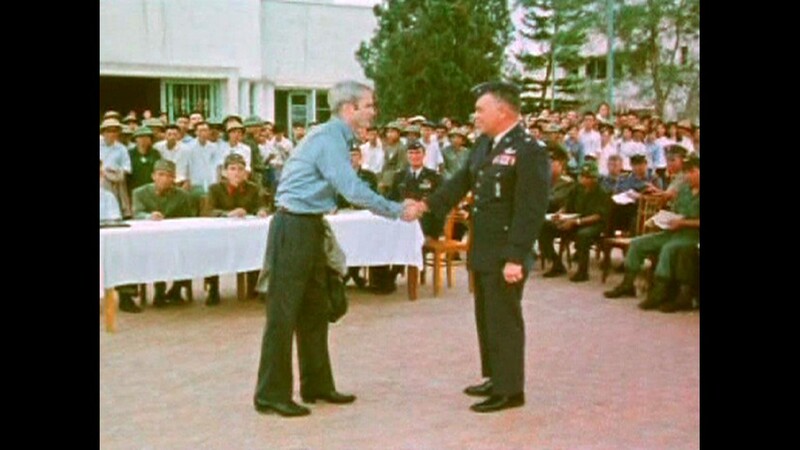 This still photo from video obtained exclusively by Associated Press Television News shows then prisoner of war John McCain shaking hands with a U.S. military officer during a ceremony as he and other POWs were released by the North Vietnamese in Hanoi on March 14, 1973. 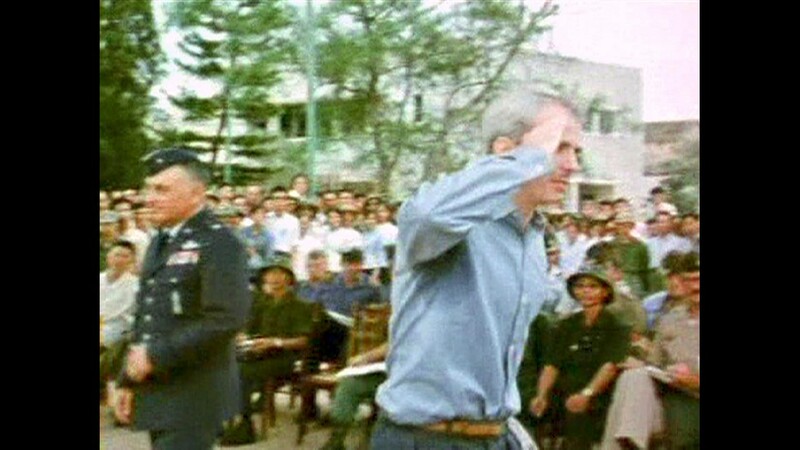 This still from video obtained exclusively by Associated Press Television News shows then prisoner of war John McCain (right) saluting during a ceremony as he and other POWs were released by the North Vietnamese in Hanoi on March 14, 1973. U.S. Navy Cmdr. John S. McCain III, a guest of the South Vietnamese government, visits an orphanage that cares for youngsters fathered by American GIs in Saigon, Vietnam, on Oct. 30, 1974. McCain, a son of the admiral who commanded U.S. forces in the Pacific at the height of the Vietnam War, was shot down over Hanoi and spent several years as a POW. U.S. Navy Cmdr. 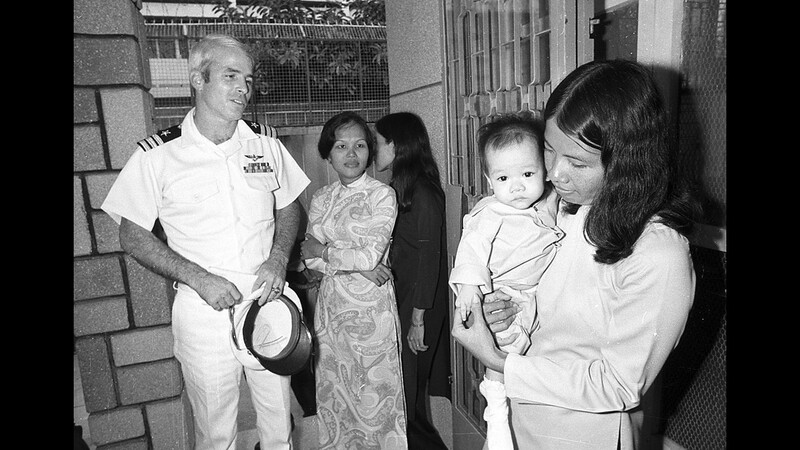 John S. McCain III, a guest of the South Vietnamese government, visits the Holt orphanage in Saigon, Vietnam, on Oct. 30, 1974. The institution cares for many youngsters fathered by American GIs. McCain, son of the admiral who commanded U.S. forces in the Pacific at the height of the Vietnam War, was shot down over Hanoi and spent several years as a POW. Former California Gov. 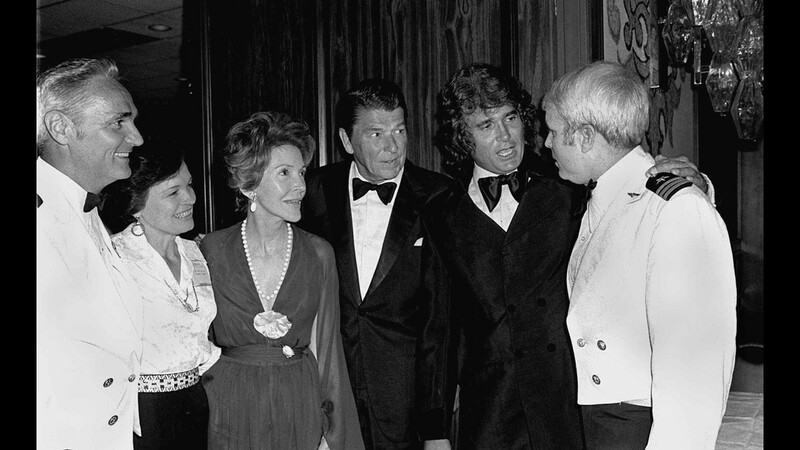 Ronald Reagan (center), actor Michael Landon (second from right), and the governor's wife Nancy, (third from left), greet former POWs during a reunion party in Los Angeles on May 28, 1978. The party featured entertainers from film and television.U.S. Navy Capt. Howard Ruttledge (left) and his wife, Phyllis. U.S. Navy Cmdr. John McCain is at right. 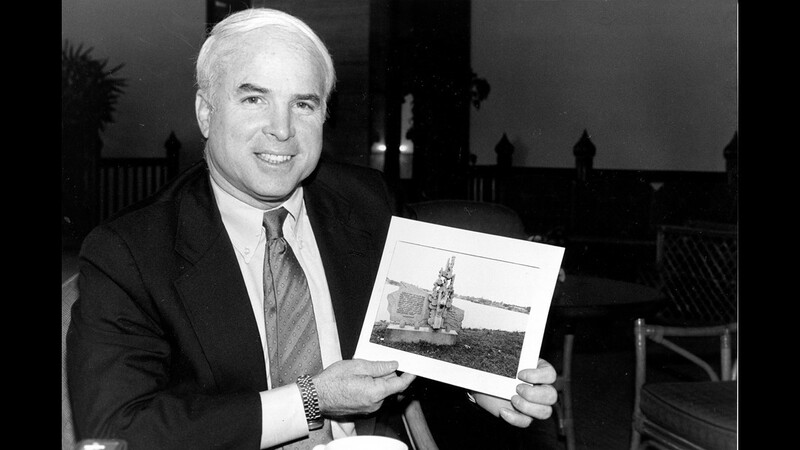 U.S. Rep. John McCain holds a photo of a marker in Hanoi, Vietnam, at Truc Bach Lake where he parachuted after being shot down as a Navy pilot in the Vietnam War. 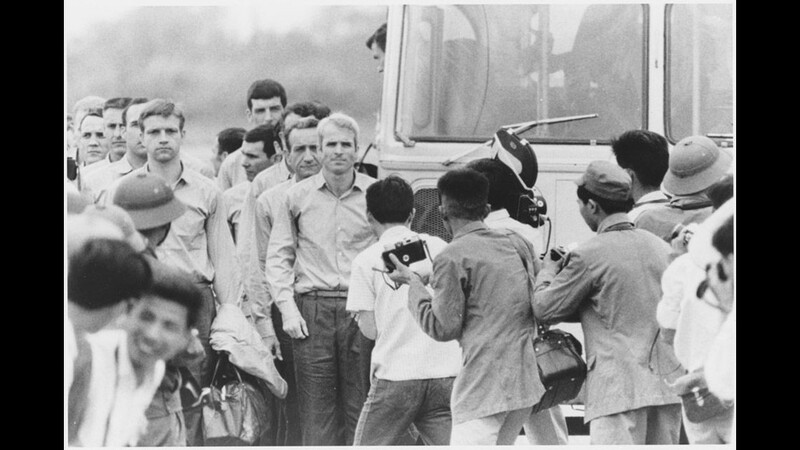 McCain, who was a POW for 5½ years in Hanoi, was in Bangkok, Thailand, on Feb. 18, 1985, en route to Hanoi to visit this site. 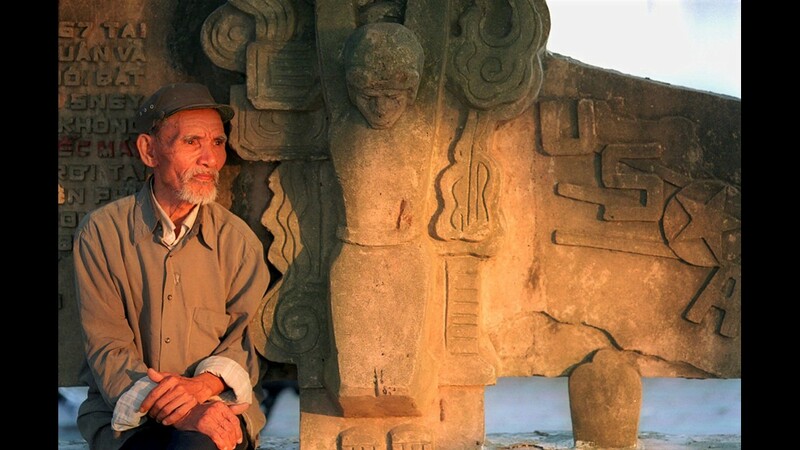 A monument was built related to Navy Lt. Cmdr. John McCain being shot down in Hanoi, North Vietnam, in 1967. 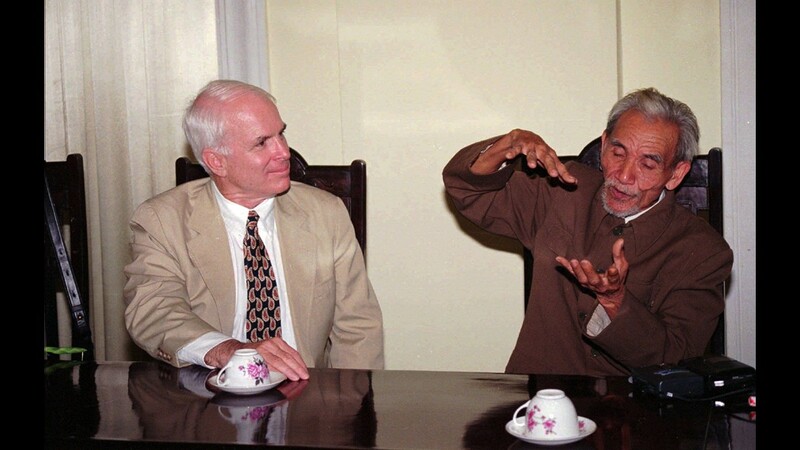 Mai Van On speaks with U.S. Sen. John McCain (left), R-Ariz., on Nov. 13, 1996, while describing how he pulled on McCain's parachute to save him from Hanoi's Truc Bach Lake after he was shot down in 1967. 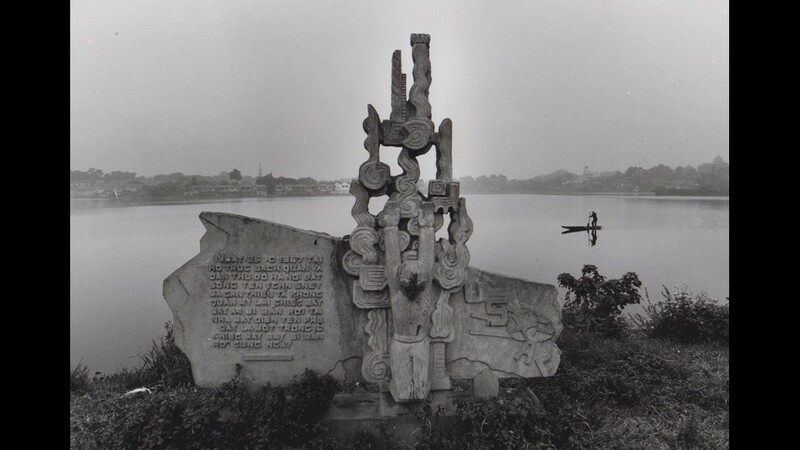 Mai Van On, 83, sits by a monument on Nov. 20, 1999, commemorating the capture of American pilot John McCain on Truc Bach Lake in Hanoi, Vietnam, where McCain was shot down Oct. 26,1967. 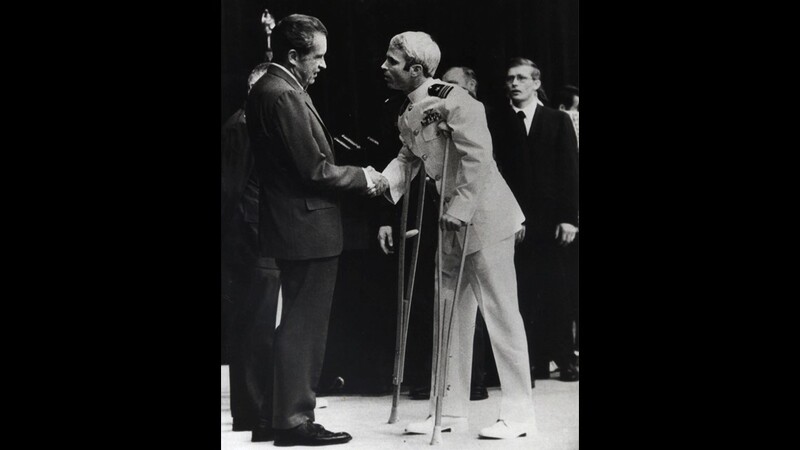 On was the man who rescued McCain after he parachuted into the lake. 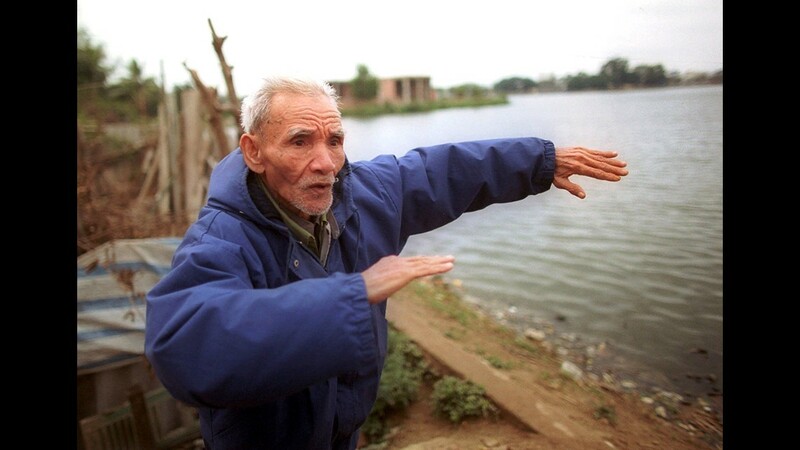 Mai Van On, 83, on Feb. 23, 2000, describes how he swam out and rescued U.S. Navy pilot John McCain from Truc Bach Lake in Hanoi 33 years before. 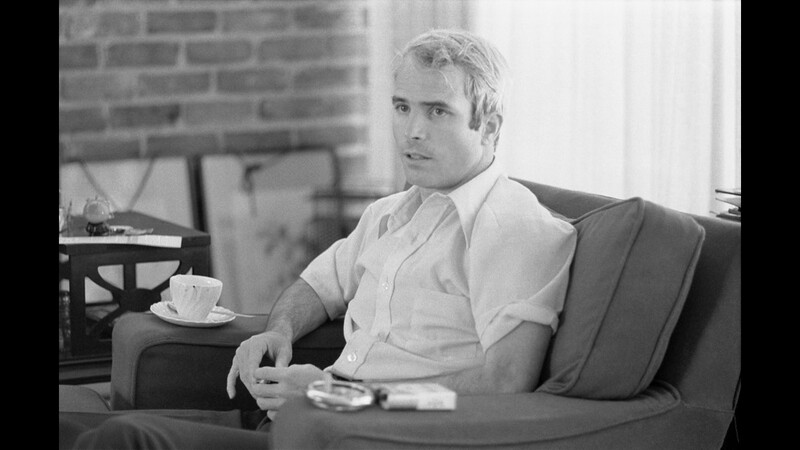 McCain, whose plane was shot down over Hanoi, spent 5½ years as a prisoner of war. 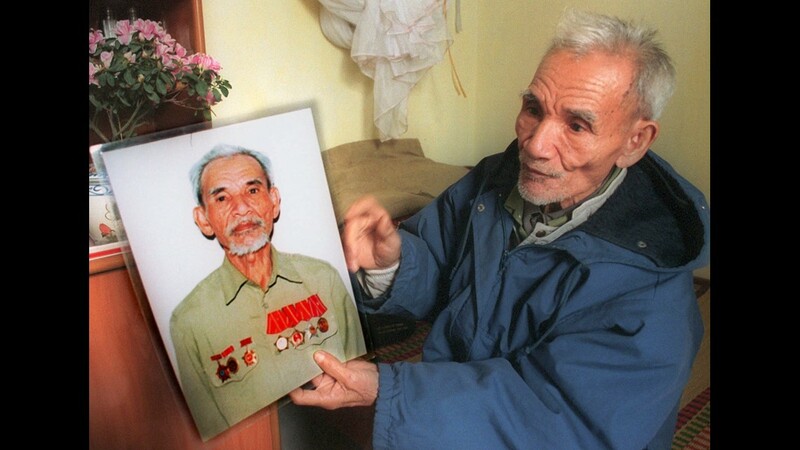 Mai Van On, 83, displays a photograph at his house in Hanoi, Vietnam, on Feb. 23, 2000, of himself with medals he was decorated with from the Vietnam War. 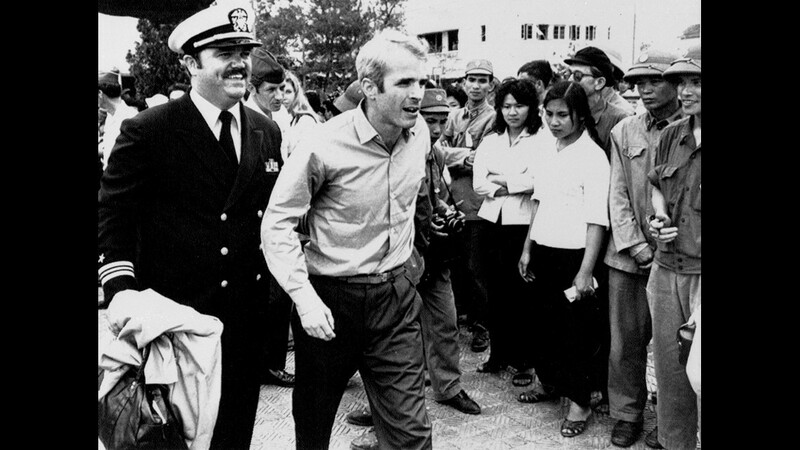 On was the man who rescued American pilot John McCain after he was shot down over Hanoi, North Vietnam, in October 1967. John McCain, congressional primary winner, with wife Cindy and daughter Sidney, on Sept. 9, 1982. 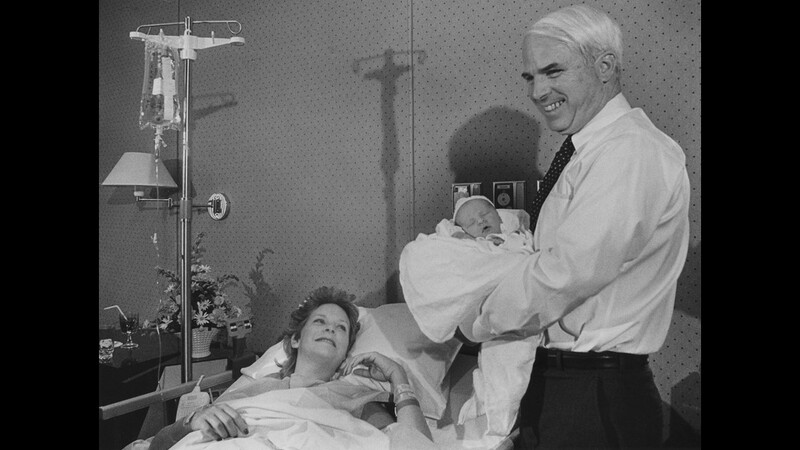 Rep. John McCain with wife Cindy and newborn daughter Meghan on Oct. 23, 1984. U.S. Rep. John McCain proudly shows off his newborn daughter Meghan to poll workers while his wife Cindy looks on at their Tempe voting place on Nov. 6, 1984. Little Meghan McCain was born 15 days before. 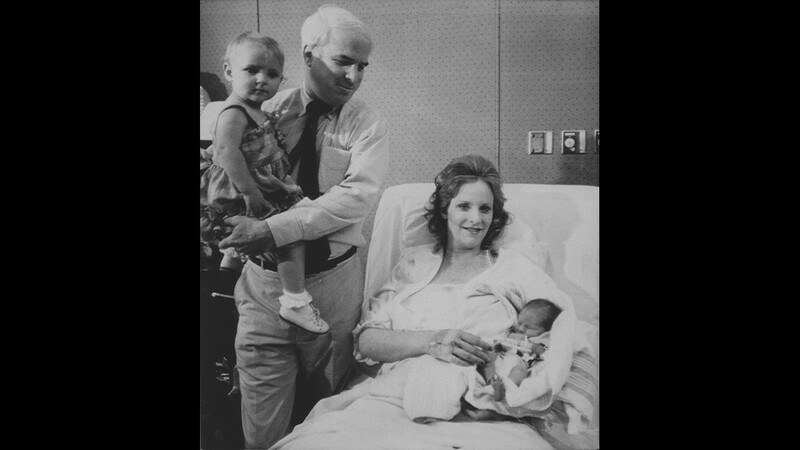 Rep. John McCain, R-Ariz., with baby Meghan and wife Cindy on Nov. 6, 1984. Rep. John McCain, R-Ariz., with baby Meghan and wife Cindy in November 1984. Arizona Rep. John McCain makes his announcement for the seat of retiring Sen. Barry Goldwater in late 1985 or early 1986. McCain's wife Cindy is to the left with their baby daughter Meghan. On the right next to McCain are Burton Barr and former Gov. Jack Williams. 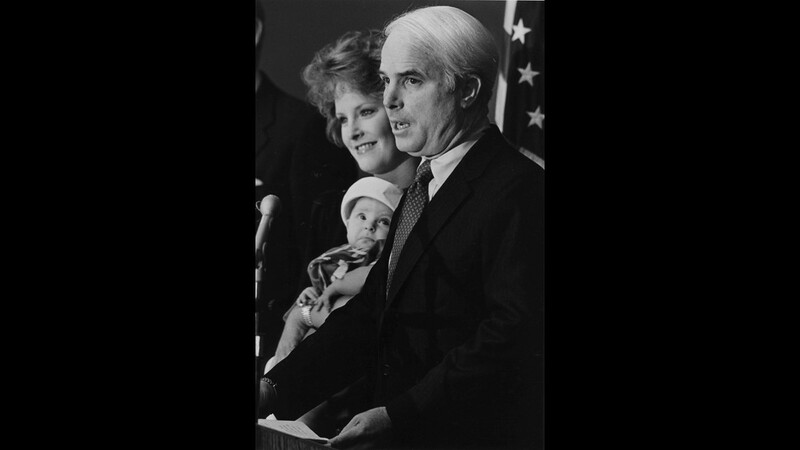 Rep. John McCain, wife Cindy and daughter Meghan in late 1985 or early 1986, as McCain announces his intention to run for retiring Sen. Barry Goldwater's seat. 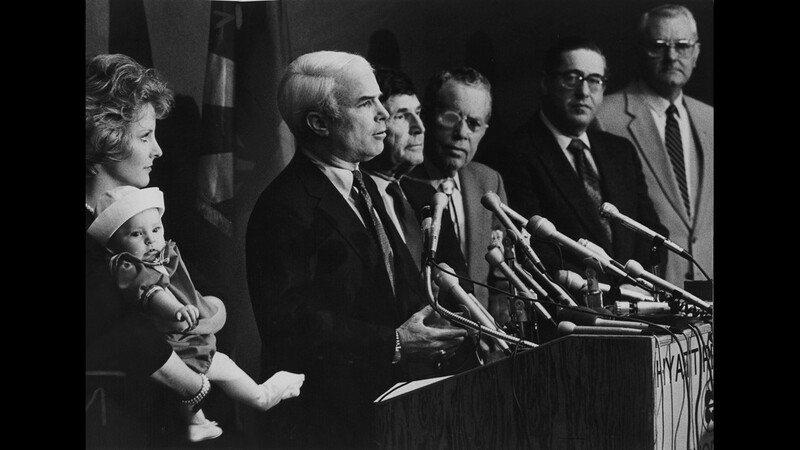 U.S. Rep. John McCain, R-Ariz., announced plans in Phoenix to seek the U.S. Senate seat in late 1985 or early 1986. Meghan McCain tweeted this undated photo Sept. 23, 2017, of her, her father Arizona Sen. John McCain, mother Cindy McCain and brother Jack McCain. 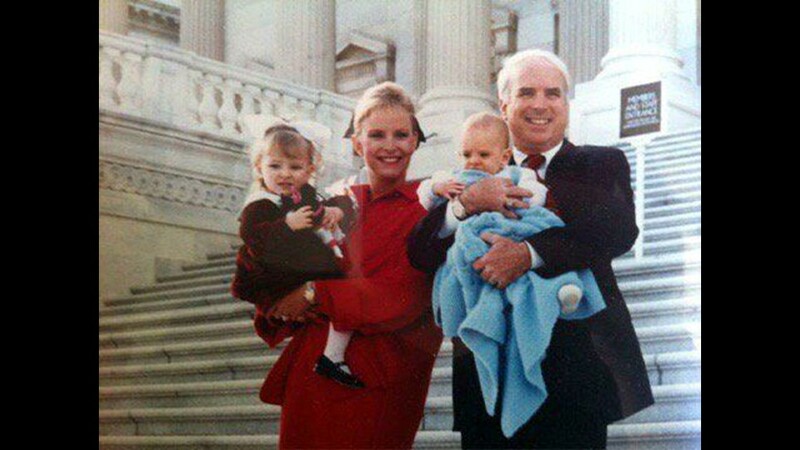 Meghan McCain tweeted this undated photo Aug. 29, 2017, of her, her father Arizona Sen. John McCain, mother Cindy McCain and brother Jack McCain. 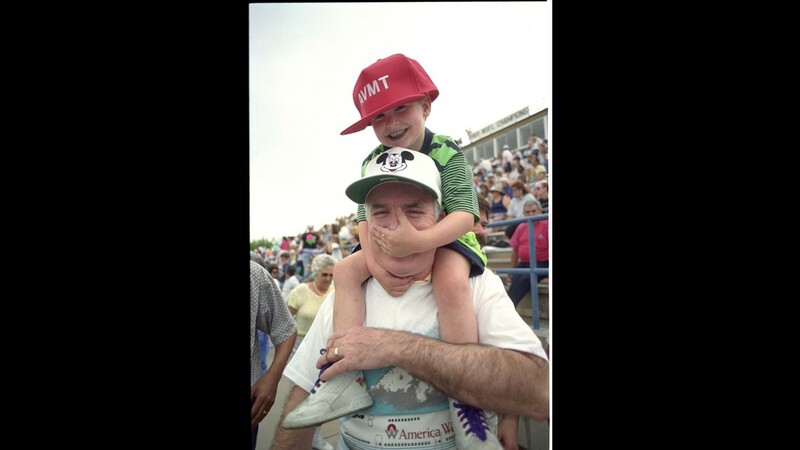 Sen. John McCain with son Jimmy in 1991. Sen. John McCain announces he will run for re-election while his son, Jack McCain, plays with a spider in January 1992. 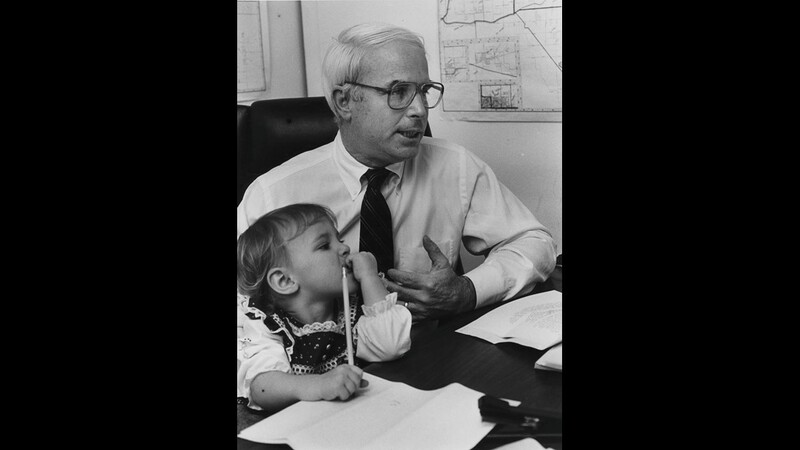 Arizona Sen. John McCain and his 3-year-old son Jimmy on April 4, 1992, in Mesa. They had attended a party sponsored by the employees of America West at Mesa Community College to thank Arizonans for their support during the company's reorganization. A victorious Sen. John McCain, with wife Cindy, son Jimmy and daughter Bridget, thanks his supporters at the Hyatt Regency in Phoenix on Election Night, Nov. 3, 1992. John McCain and family celebrate his Senate re-election on Nov. 4, 1992, at the Hyatt Regency in Phoenix. Republican presidential candidate John McCain and his wife Cindy pose with their children in this undated file photo. Children are (from left): Meghan, 14; Bridget, 8; Jimmy, 11; and Jack, 13. Bridget was adopted from an orphanage in Bangladesh. Cindy McCain, wife of Sen. John McCain, joins their children (form left) Meghan, 13, Jack, 11 (partially hidden), Bridget, 6, and Jimmy, 9, before the senior senator from Arizona announces his bid for re-election on April 17, 1998, at Republican Party Headquarters. Texas Gov. George W. Bush (right) is greeted by Andy McCain (left), son of Arizona Sen. John McCain (center), at a fundraising dinner for the senator's re-election bid at Pinnacle Peak Patio in Scottsdale on April 25, 1998. 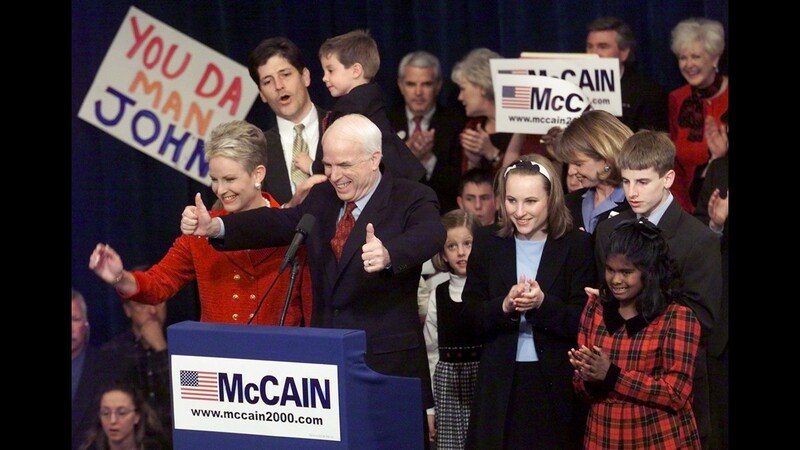 Republican Sen. John McCain, with his wife Cindy (center) and adopted daughter Bridget (left), announces his official bid for the 2000 presidential race on Sept. 27, 1999, in Nashua, New Hampshire. McCain's daughter is originally from Bangladesh. Arizona Sen. and Republican presidential hopeful John McCain introduces his family (with wife Cindy), who arrived from Arizona, as the candidate spoke at a rally in January 2000 in downtown Keene, New Hampshire, during a statewide bus trip celebrating the next day's New Hampshire primary. Cindy (right) waves and the children are: Meghan (center, with white turtleneck), Jimmy (with glasses), Jack (hidden by Cindy), and Bridget (far right). Sen. John McCain (right) shares a dance with his daughter Meghan McCain during the Board of Visitors Debutante Ball at Camelback Inn in Phoenix on April 5, 2003. Sen. John McCain arrives with his wife Cindy and daughter Megan at "Live From New York It's Wednesday Night" on Sept. 1, 2004, at Cipriani's 42nd Street, in New York City. Republican presidential hopeful Sen. John McCain, R-Ariz., shares a laugh with his son Jack as he joined his father during a reception after McCain was given an honorary doctor of law degree from Newberry College on Dec. 15, 2007, in Newberry, South Carolina. Republican presidential hopeful Sen. John McCain (left), R-Ariz., gives a thumbs up as he walks with his wife Cindy (center) and daughter Bridget (right) in downtown Manchester, New Hampshire, on Jan. 7, 2008. Meghan McCain (left) with her dad, Republican presidential hopeful Sen. John McCain, R-Ariz., on election night in Nashua, New Hampshire, on Jan. 8, 2008. Republican presidential hopeful Sen. John McCain (center), R-Ariz., stands on stage with his wife Cindy (left) and daughter Meghan after the Fox News Republican presidential debate in Myrtle Beach, South Caroline on Jan. 10, 2008. 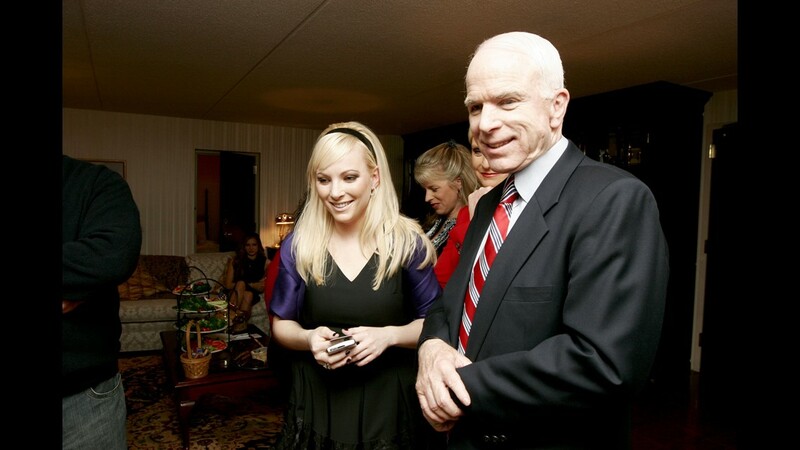 Meghan McCain and her dad, John McCain, on the 2008 presidential campaign trail. Jack McCain (left) and Jimmy McCain, sons of presumptive Republican presidential nominee Sen. John McCain, R-Ariz., attend on Day 1 of the Republican National Convention at the Xcel Energy Center Sept. 1, 2008, in St. Paul, Minnesota. Republican presidential candidate Sen. John McCain, R-Ariz., hugs his daughter Sidney McCain after arriving at the airport in Minneapolis, Minnesota, for the Republican National Convention on Sept. 3, 2008. McCain's oldest son Doug looks on. The families of Republican presidential candidate Sen., John McCain, R-Ariz., and his running mate, Alaska Gov. Sarah Palin, pose for a photograph at the airport in Minneapolis, Minnesota, after McCain arrived for the Republican National Convention on Sept. 3, 2008. 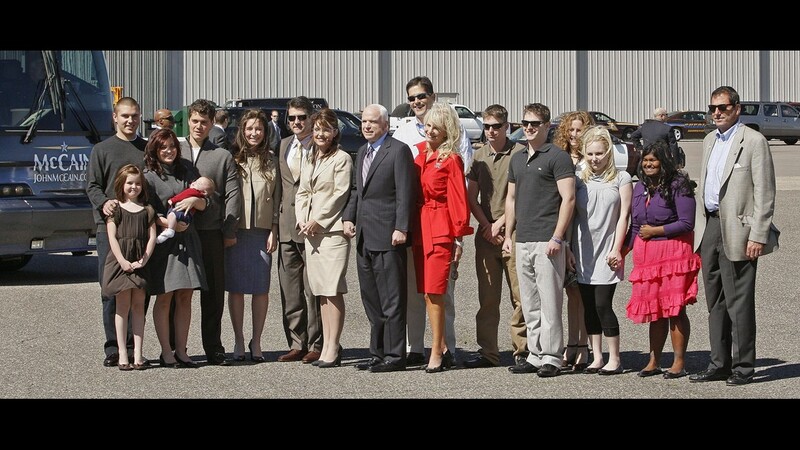 From left to right: Track Palin, Piper Palin, Willow Palin, holding Trig Palin, Levi Johnson, Bristol Palin, Todd Palin, Gov. Palin, Sen. McCain, Andy McCain, Cindy McCain, Jimmy McCain, Jack McCain, Sidney McCain, Meghan McCain, Bridgette McCain, Doug McCain. Presumptive Republican presidential nominee John McCain, R-Ariz., jokes around with his son Jack McCain during a visit to a GOP delegates hurricane-relief event at the Minneapolis Convention Center Sept. 3, 2008, in Minneapolis, Minnesota. The elder McCain arrived for his appearance at the Republican National Convention. Children of Sen. John McCain (from left) Bridget, Meghan, John and Jimmy stand as they are introduced by their father during the Republican National Convention at the Xcel Energy Center in St. Paul, Minnesota, on Sept. 4, 2008. Cindy McCain (center), wife of Republican U.S presidential nominee Sen. John McCain, R-Ariz., stands with her children (from left) Meghan, Andy, Jimmy, Jack, Doug, Bridget, and Sidney during Day 4 of the Republican National Convention at the Xcel Energy Center on Sept. 4, 2008, in St. Paul, Minnesota. Republican presidential candidate Sen. John McCain, R-Ariz., addresses supporters at a campaign rally in Toledo, Ohio, as his daughter Meghan applauds on Oct. 19, 2008. Republican presidential nominee Sen. John McCain (right), R-Ariz., his wife Cindy McCain (center) and their son Jack McCain turn in their absentee ballots at their local polling place on Nov. 4, 2008, in Phoenix, Arizona. Vice presidential nominee Alaska Gov. Sarah Palin's daughter Piper Palin (left), presidential nominee Sen. John McCain's children Meghan McCain (from second left), Jimmy McCain, Doug McCain, Jack McCain and Andrew McCain, and McCain's mother Roberta McCain stand on stage as John McCain, R-Ariz., concedes victory during the Election Night rally at the Arizona Biltmore Resort & Spa on Nov. 4, 2008, in Phoenix, Arizona. Sen. Barack Obama, D-Ill., defeated McCain by a wide margin in the election to become the first African-American U.S. President elect. Sen. John McCain (left), R-Ariz., and his wife Cindy walk with their son Jack after he graduated from the U.S. Naval Academy in Annapolis, Maryland, on May 22, 2009. 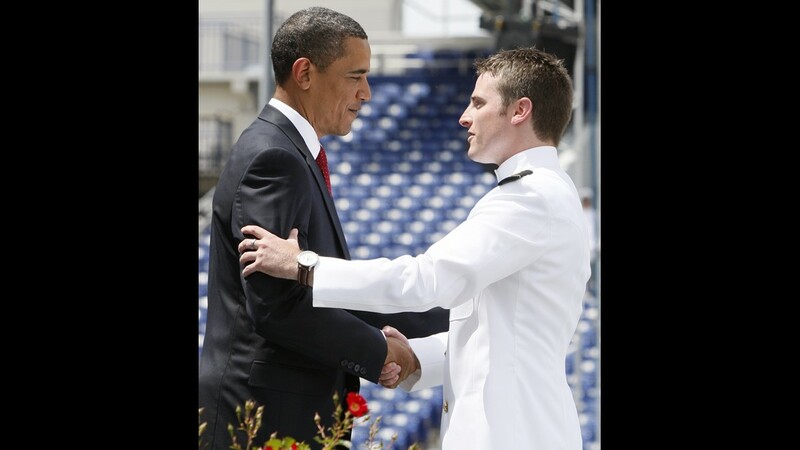 President Barack Obama congratulates Jack McCain, son of Sen. John McCain, R-Ariz., as he graduates from the United States Naval Academy in Annapolis, Maryland, on May 22, 2009. Sen. John McCain, R-Ariz., U.S. Navy ensign Jack McCain, and John McCain's wife Cindy McCain attend the baseball game between the San Diego Padres and Arizona Diamondbacks at Chase Field on May 25, 2009, in Phoenix, Arizona. The Padres defeated the Diamondbacks 9-7. Sen. John McCain (left), R-Ariz., speaks to the crowd with his wife Cindy McCain (right) and daughters Meghan McCain (second from right) and Bridget McCain during an Arizona Republican Party Election Night event at the Hyatt Regency Nov. 2, 2010, in Phoenix. McCain easily defeated his opponent Democratic candidate Rodney Glassman. 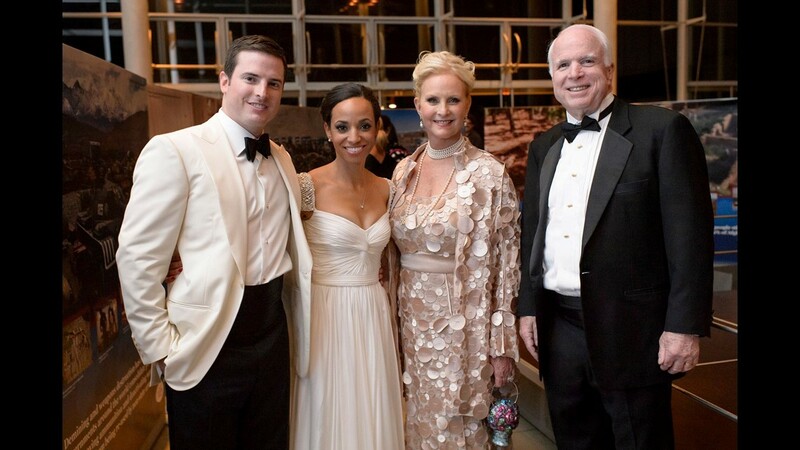 Jack (from left), Renee, Cindy and John McCain are pictured at Jack and Renee's weekend wedding in San Francisco in summer 2013. 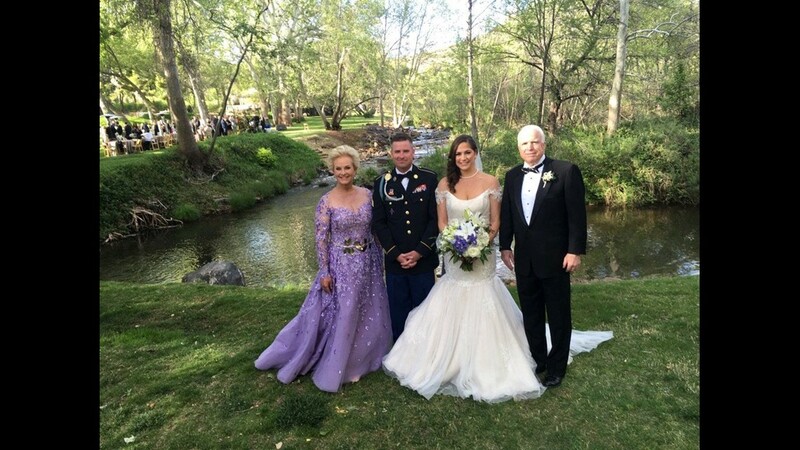 Cindy McCain tweeted this photo June 19, 2015, of her and husband John McCain's son Jack's wedding. Sen. John McCain, Meghan McCain and Jimmy McCain attend the "Raising McCain" series' New York premiere at Tribeca Cinemas on Sept. 12, 2013, in New York City. Sen. John McCain and daughter Meghan McCain arrive at the White House Correspondents' Association annual dinner in Washington on May 3, 2014. Cindy McCain tweeted this photo April 17, 2016, of her and husband John McCain's son Jimmy's wedding. Cindy McCain tweeted this photo April 17, 2016, of her and husband John McCain's son Jimmy's wedding. Other McCain family members are son Jack (second from left), Jack's wife Renee (yellow dress), and daughters Bridget (light blue dress) and Meghan. Cindy McCain tweeted this photo May 20, 2016, of the McCain family at Jack McCain's graduation from Georgetown University. Cindy McCain tweeted this photo Jan. 3, 2017, of husband Sen. John McCain's swearing in. 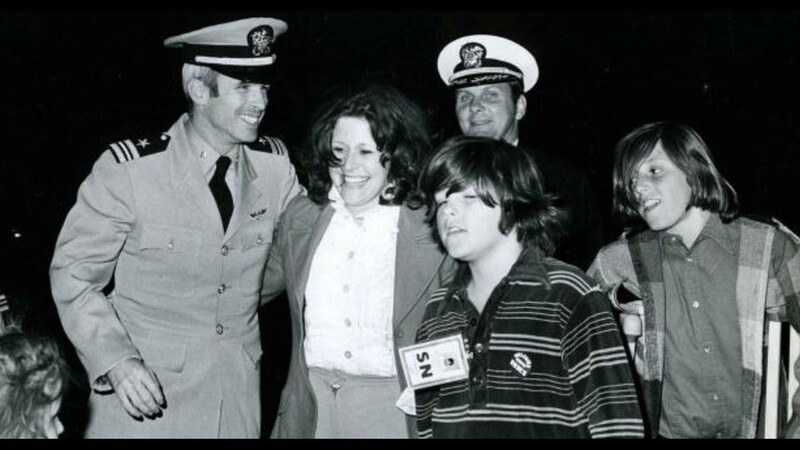 McCain stands with the couple's sons Jack (left) and Jimmy (right), along with Jimmy's wife. 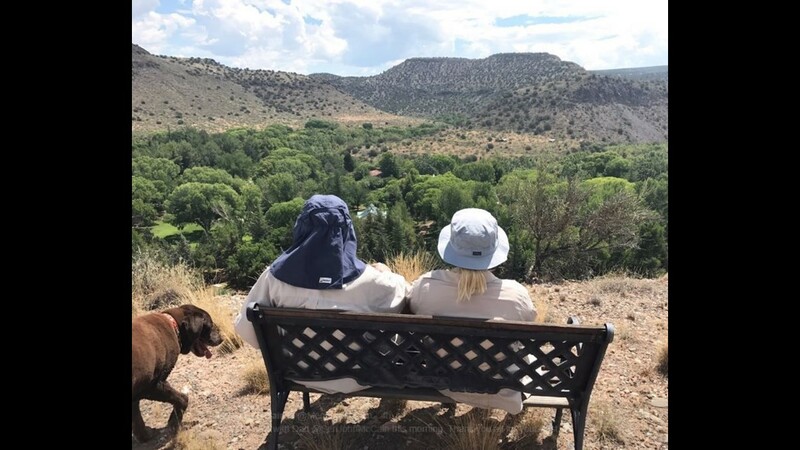 Meghan McCain tweeted this photo, which she says was taken on a hike with her dad, Sen. John McCain, on July 22, 2017. He was recently diagnosed with brain cancer. Sen. John McCain, his daughter Meghan McCain, and his wife Cindy McCain attend the Arizona Diamondbacks and Los Angeles Dodgers game on Aug. 10, 2017, at Chase Field in Phoenix. Cindy McCain tweeted this photo Aug. 10, 2017, of her, husband John McCain and their daughter Meghan McCain at an Arizona Diamondbacks game. Sen. John McCain and his daughter, Meghan McCain, sitting outside the family's cabin in Sedona in February 2018. U.S. Sen. John McCain at his office in Phoenix on Monday, April 6, 2015. Then-U.S. Navy Commander John McCain, a guest of the South Vietnamese government, visits an orphanage that cares for youngsters fathered by American G.I.s in Saigon, Vietnam, on Oct. 30, 1974. McCain, a son of the admiral who commanded U.S. forces in the Pacific at the height of the Vietnam War, was shot down over Hanoi and spent several years as a POW. 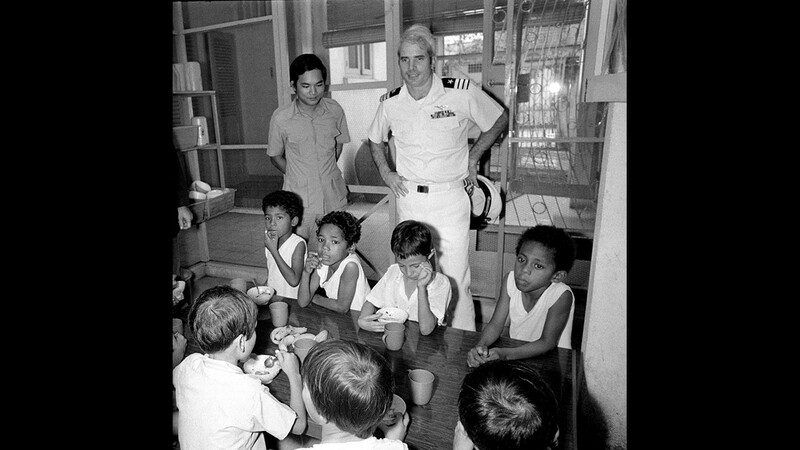 Then-U.S. Navy Commander John McCain, a guest of the South Vietnamese government, visits the Holt orphanage in Saigon, Vietnam, on Oct. 30, 1974. The institution cares for many youngsters fathered by American G.I.s. McCain, son of the admiral who commanded U.S. forces in the Pacific at the height of the Vietnam War, was shot down over Hanoi and spent several years as a POW. 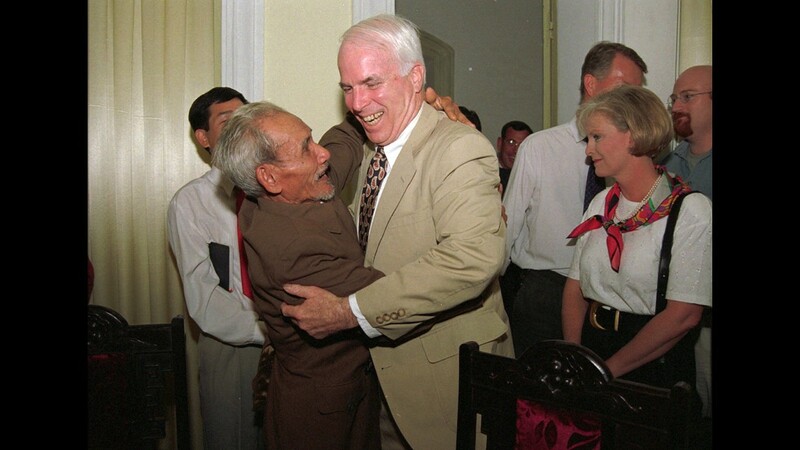 Then-U.S. Rep. John McCain holds a photo of a marker in Hanoi, Vietnam, at Truc Bach Lake where he parachuted after being shot down as a Navy pilot in the Vietnam War. McCain, who was a POW for 5½ years in Hanoi, was in Bangkok, Thailand, on Feb. 18, 1985, en route to Hanoi to visit this site. John McCain speaks to an audience in Encanto Park in Phoenix on Oct. 18, 1986. As John McCain looks on (left), Vice President George H. W. Bush is greeted by Evan Mecham during a visit to Phoenix in October 1986. Sen. John McCain, R-Ariz., center right, huddles with Sen. Carl Levin, D-Mich., to discuss strategy at the conclusion of the daily members meeting in the Mansfield room near the Senate floor in Washington on March 26, 2001. Sen. John McCain addresses the media at Swift Aviation at Sky Harbor International Airport on May 5, 2008. Sen. John McCain and President George Bush shake hands at Phoenix Sky Harbor International Airport at the end of the president's brief visit to the Valley on May 27, 2008. Republican presidential candidate Sen. John McCain, R-Ariz., smiles as he appears with former first lady Nancy Reagan Tuesday, March 25, 2008, in Bel Air, Calif. Reagan endorsed McCain for president as the Arizona senator continued to collect the backing of leading Republicans who might help him win over critical conservative voters. Republican presidential nominee U.S. Sen. John McCain concedes victory on stage during the election night rally at the Arizona Biltmore Resort & Spa on Nov. 4, 2008, in Phoenix. Republican presidential nominee John McCain and his running mate, Sarah Palin, bask in the celebration at the Republican National Convention in St. Paul on Sept. 4, 2008. Democratic presidential candidate U.S. Sen. Barack Obama (R) (D-Ill.) and Republican presidential candidate U.S. Sen. John McCain (R-Ariz.) shake hands after the first of three presidential debates before the 2008 election on Sept. 26, 2008. Then-President-elect Barack Obama applauds Arizona Sen. John McCain, the former Republican presidential candidate, during a bipartisan dinner in McCain's honor on Jan. 19, 2009, in Washington, D.C., on the night before Obama's inauguration as 44th U.S. president. Arizona Sen. John McCain talks with host David Letterman in this 2008 Late Show appearance. Sen. John McCain and former Republican vice presidential nominee Sarah Palin make a campaign appearance on March 26, 2010, at the Pima County Fairgrounds in Tucson, Arizona. Sen. John McCain gets his own apron after talking to employees at the Home Depot Rapid Deployment Center in Tolleson, to campaign and tour the new facility on July 30, 2010. Sen. John McCain and wife Cindy cast their ballots at Madison Camelview Elementary School in Phoenix on Aug. 24, 2010. U.S. Sen. John McCain, R-Ariz., and his wife, Cindy McCain celebrates his win in the GOP primary race, on Aug. 24, 2010, at the Phoenix Convention Center in Phoenix. Sen. McCain defeated former Rep. J.D. Hayworth. U.S. Sen. John McCain (R-Ariz.) speaks as Sen. Joseph Lieberman (ID-Conn.) (center) and Sen. Marco Rubio (R-FL) (left) listen during a news conference about the crisis in Syria on May 11, 2011, on Capitol Hill in Washington, DC. Former presidential nominee, U.S. Sen. John McCain (R-Ariz.) (R) announced that he is endorsing Republican presidential candidate and former Massachusetts Gov. Mitt Romney during a town hall meeting at Central High School January 4, 2012, in Manchester, New Hampshire. Sen. John McCain celebrates a goal by the Phoenix Coyotes as they host the Nashville Predators in the first period of Game 2 of the second round playoff series Sunday, April 29, 2012, in Glendale. Senator John McCain speaks during a gathering of supporters for presidential candidate Mitt Romney Tuesday, Feb. 28, 2012, at the Hyatt Regency in Phoenix. Sen. John McCain holds a town hall with West Valley residents at Peoria City Hall, on Aug. 23, 2012. From left, Sen. John McCain, R-Ariz., Sen. Charles Schumer, D-N.Y. and Sen. Lindsey Graham, R-S.C. sit on Capitol Hill in Washington, Tuesday, Feb. 12, 2013, before President Barack Obama's State of the Union address during a joint session of Congress. Sen. John McCain speaks with those gathered at a town hall meeting at the Goelet A.C. Beuf Community Center in Phoenix on March 24, 2013. Sen. John McCain visits U.S. troops at a missile site in Turkey on May 27, 2013. McCain quietly slipped into Syria for a meeting with rebels. Sen. John McCain laughs during an exchange with Secretary of State John F. Kerry. The two spoke during a 2013 U.S. Senate Committee on Foreign Relations hearing about the authorization of use of force in Syria. Sens. John McCain and Jeff Flake address members of the media at McCain's Phoenix office on May 28, 2014, following the release of a report stating by the Veterans Affairs that at least 1,700 veterans at the medical center were not registered on the proper waiting list, putting them at risk in the convoluted scheduling process. Sen. John McCain hugs Mitt Romney during a rally for John McCain's re-election campaign at Dobson High School on Dec. 12, 2015 in Mesa. Sen. John McCain with his wife Cindy gives a victory speech to his supporters during his campaign party at Heard Museum, Steele Auditorium in Phoenix on Nov. 8, 2016. U.S. Sen. John McCain reacts at The Sandra Day O'Connor College of Law at Arizona State University on Aug. 15, 2016. Sen. John McCain greets supporters after winning his sixth Senate term during his campaign party at the Heard Museum in Phoenix on Nov. 8. Sen. John McCain greets supporters after winning sixth Senate term during his campaign party at the Heard Museum in Phoenix on Tuesday, Nov. 8, 2016. Sen. John McCain, R-Ariz., left, and Senate Foreign Relations Committee Chairman Sen. Bob Corker, R-Tenn. walk on Capitol Hill in Washington, Thursday, July 13, 2017, for a meeting on the revised Republican health-care bill which has been under attack from within the party. Sen. John McCain listens to former FBI director James Comey at a Senate Intelligence Committee hearing. FBI director James Comey testified before the Senate Intelligence Committee as part of its investigation into Russia's interference in last year's presidential election and possible collusion between the Trump campaign and Russian officials on June 8, 2017, in Washington.